AUSTIN, Texas — Texas Gov. Greg Abbott on Saturday called for doubling the state’s unarmed guard forces, which were stretched thin by Hurricane Harvey and its aftermath. The Republican said at a Veteran’s Day rally in Austin that if re-elected next year, he’ll seek to expand the Texas State Guard to 5,000 volunteer members. He said it would make Texas better equipped to handle the next disaster. Expandin the state guard to that size would amount to a major surge in the volunteer unit, which unlike the Texas National Guard, can’t be deployed beyond state lines and doesn’t carry firearms. Abbott, who is up for re-election in 2018, is making a more robust state guard one of his earliest visions of a second term. Few if any U.S. governors are better positioned entering next year’s midterm elections: Abbott has yet to attract a credible challenger, and Democrats seem uneager to take on an incumbent who won by 20 points in 2014 and has $40 million socked away. Harvey killed more than 80 people and has been Abbott’s biggest test as governor. 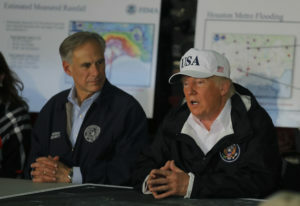 In the days after the Category 4 storm made landfall and dumped a record 50-plus inches of rain on Houston — leaving swaths of the nation’s fourth-largest city underwater — Abbott activated more than 12,000 members combined from the state guard and Texas National Guard. Beefing up the State Guard is part of a broader policy plan surrounding veterans and the military that Abbott is rolling out early in his re-election campaign. It includes plans to reduce homelessness among veterans and more access to mental health services. In 2015, the relatively obscure Texas State Guard received national attention after Abbott drew ridicule for ordering the guard to monitor a U.S. military training exercise known as “Jade Helm 15.” He did so amid Internet-fueled suspicions that the war simulation was really a hostile military takeover of Texas by the federal government. Abbott called the criticism overblown, saying at the time he was merely responding to citizen concerns and not legitimizing conspiracy theories.